The legendary sun birds of Chengdu has flown onto our shore and set up their nest at Amoy Street. Birds Of A Feather is a new all day dining, cafe and bar concept in the conservation shophouses on Amoy Street. 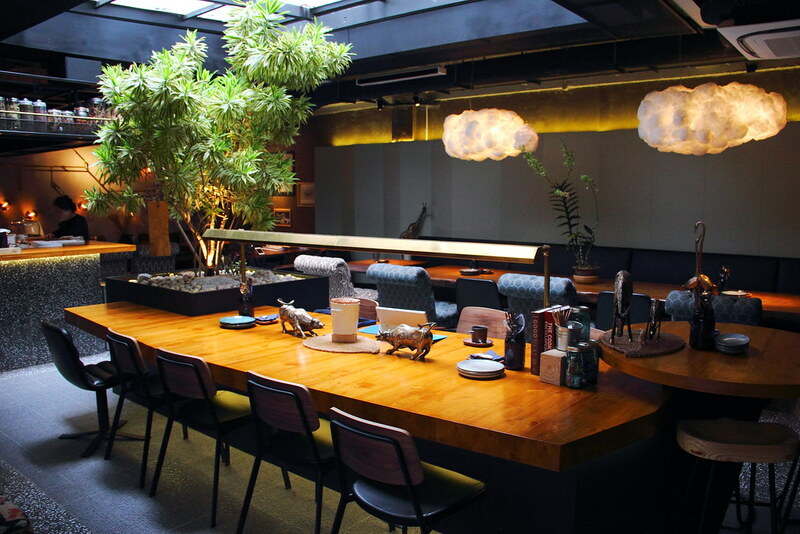 The new establishment offers contemporary Western cuisine with a pronounced Sichuan influence. The people behind it are from Chengdu who owns the Good Wood Cafe, a successful cafe chain across Chengdu. Mentioned earlier, Birds Of A Feather is a 3 in 1 dining concept. For those planning to have a drink or two at the bar, there are around 9 items from the small plate menu which go well with the drinks. 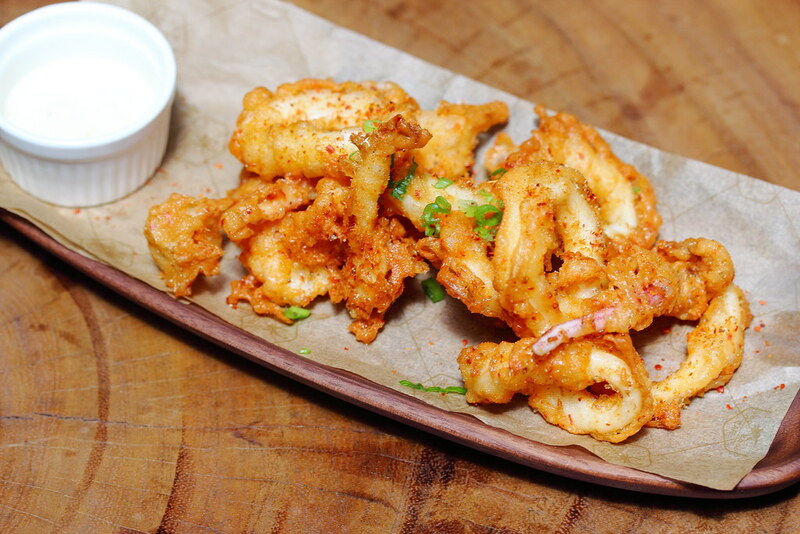 A popular bar bites is the Fried Calamari ($19). Over here, the bouncy texture of the squid is dressed in a light coat of crispy batter. 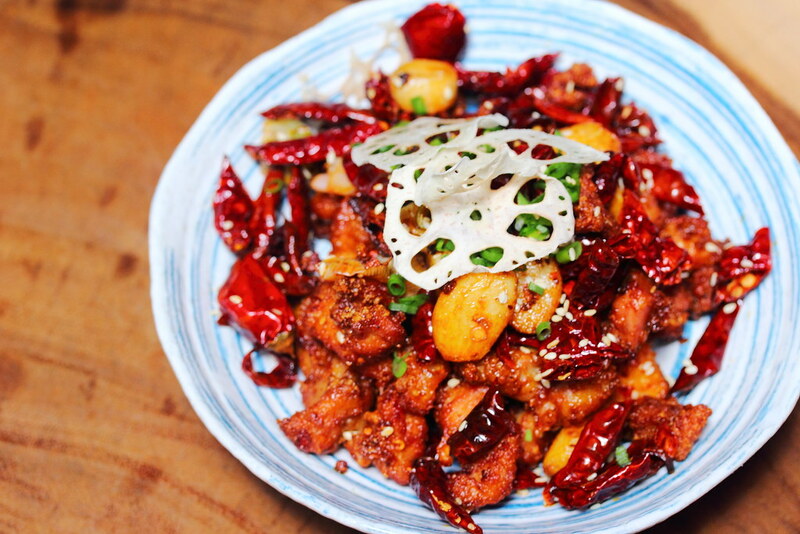 It is then sprinkled with Sichuan spices for an elevated enjoyment. 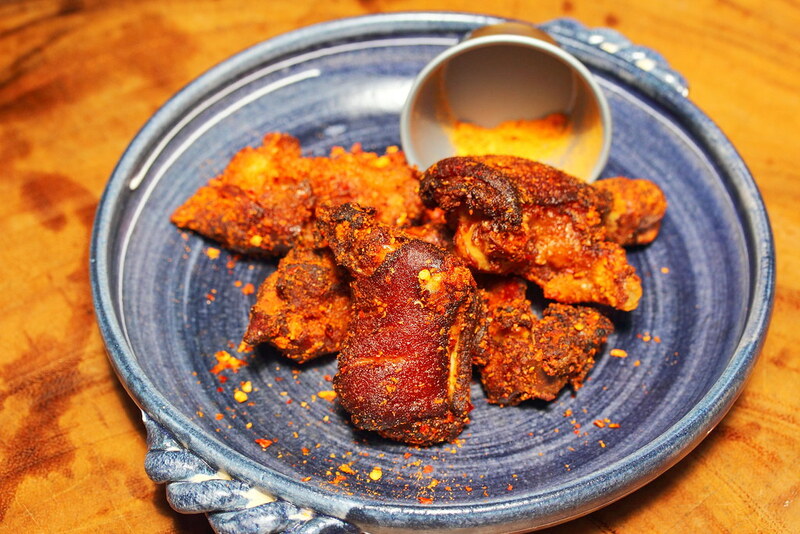 Something new to the table is the Crispy Pork Trotter in a Bag ($12). Like shaker fries, the special Sichuan spice is poured into the bag and given a good shake to coat the succulent and crispy deep fried pork trotter. A little bit salty with a little tinge of spiciness, this is perfect to go with a glass of beer. Did you manage to Find the Chicken in The Chillies ($16)? Crispy, succulent and super spicy. It has all the elements that made me love this staple Sichuan dish. This is definitely one of the best I have eaten in Singapore. 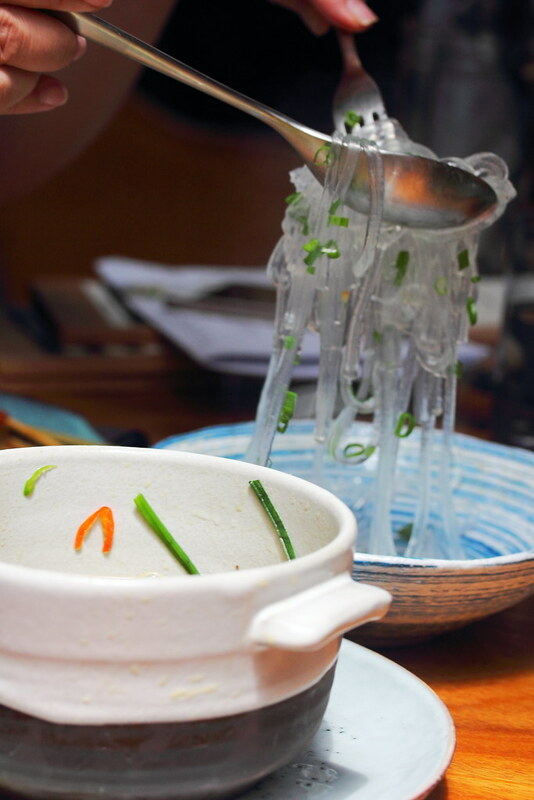 The Fortune Skewer in Szechuan Pepper Broth ($19) is like lucky dip. 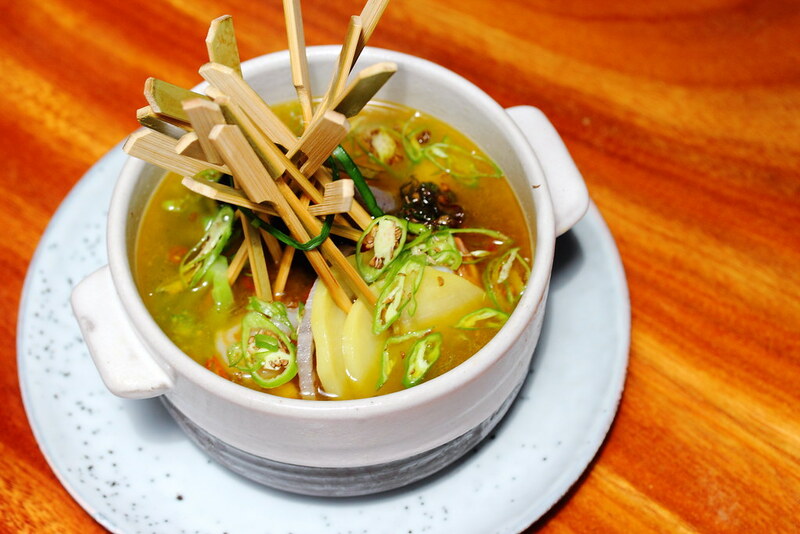 You never know what ingredient is at the end of the skewer until you pull it out from the mala broth. I managed to get quail egg, potato, lotus root and black fungus. You can even choose to add some silky smooth Japanese Arrowroot Noodle ($5) to make it a meal itself. At Birds Of A Feather, not everything is spicy. It also have your usual western fare but maybe with a little twist. 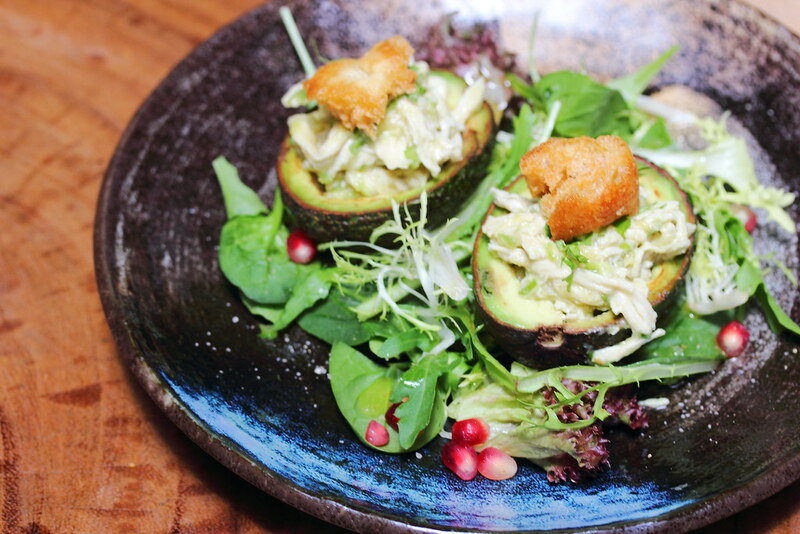 The Roasted Chicken & Avocado Salad with Szechuan Pepper ($20) is one of the non spicy items on the menu. It comes on a bed of mixed greens and dressed in lemon juice. Another non spicy item on the menu is the Charcoal Roasted Romaine Lettuce ($16) dressed in sesame sauce. I didn't know that charred romaine lettuce can taste that good. 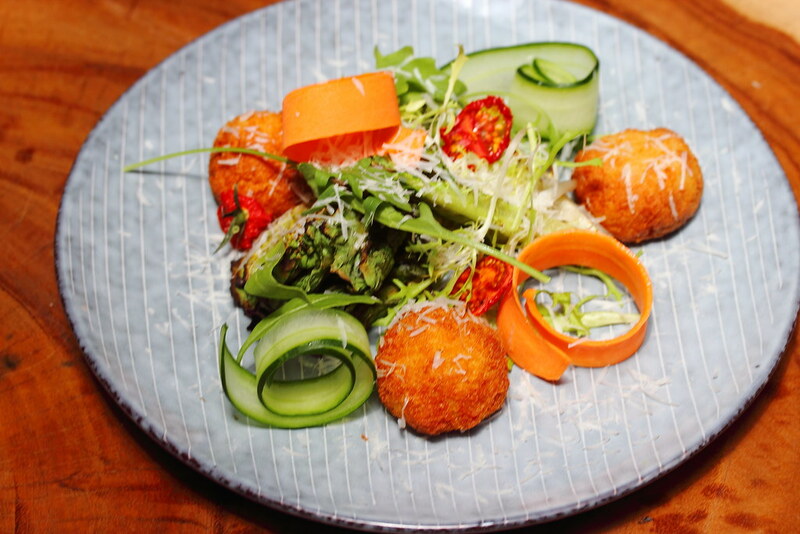 I found the fried tofu cheese ball somewhat familiar until someone on the table reminded me it tasted like fish finger. The Grilled Cheese Panini ($20) is an Asian twist with Sichuan influence. 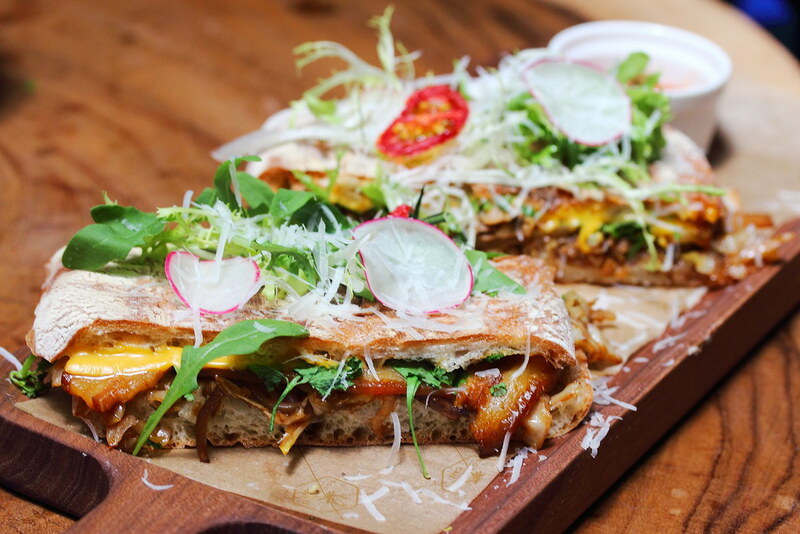 Sandwiched in between the toasted bread is braised pork belly, pickled cabbage and fried potato. An delectable combination that will be well received by the customers. As the name suggests, the Oriental Bolognaise ($20) is an Asian inspired pasta dish. It has both the non spicy and spicy version. Add $2 for the spicy version. 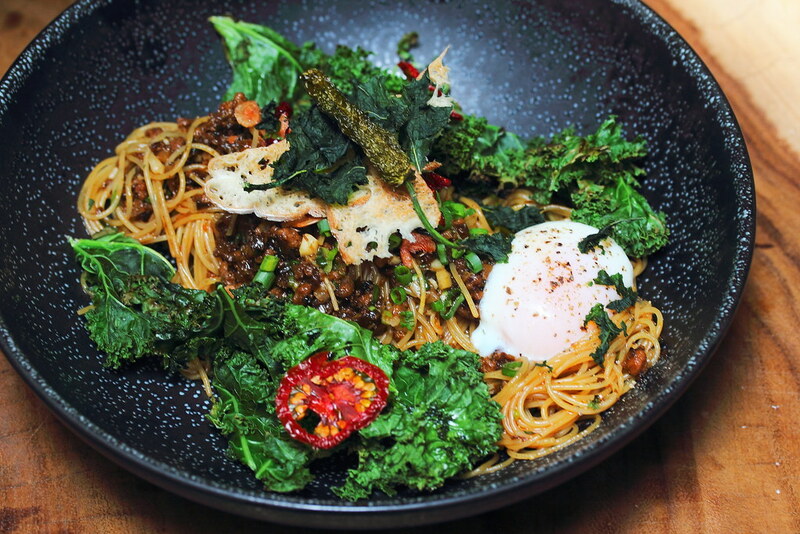 The angel hair pasta comes with pork ragout, onsen tamago, wilted kale and sakura ebi. It felt like having a bowl of zha jiang mian in a slurping good way. 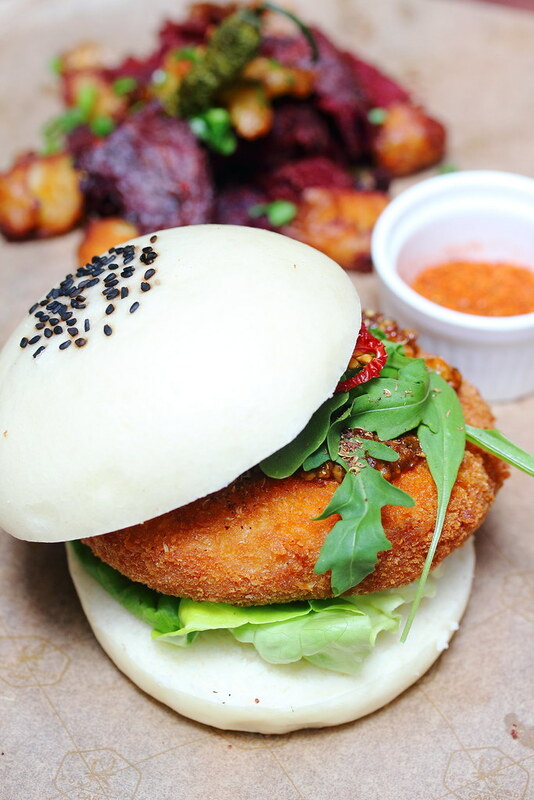 The Tofu Burger with Mapo Meat Sauce ($22) is made up of homemade Chinese bun with tofu cheese patty, mapo pork ragout, pickled cucumber in between. Diners also have a choice of fried potato or greens for the side. The interpretation of the classic hamburger if not on par, is as good as many burger joints out there, giving a fresh twist to the tradition. Only available on the diner menu is the Hot & Sour Chazuke ($28). This is one of my favourite dishes. 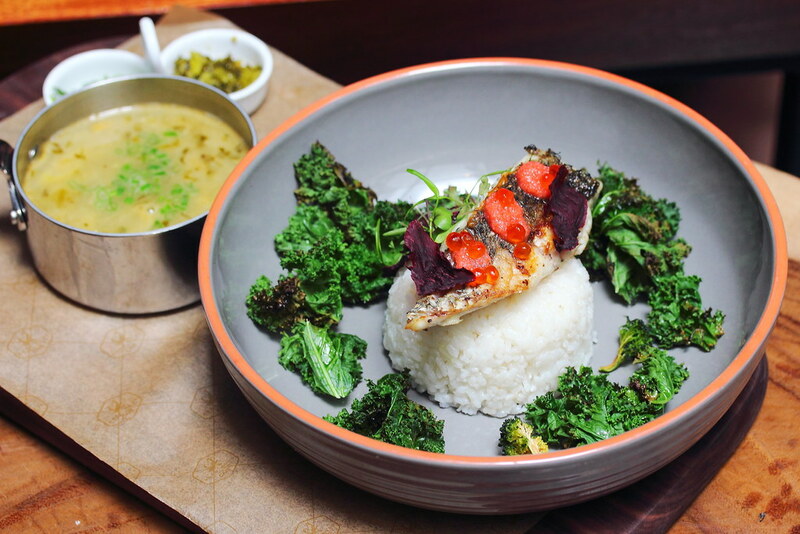 A spicy pickled mustard green broth is poured into the bowl of Niigata rice with charcoal grilled barramundi and mentaiko. Mixed them together and eat it like a porridge. The salt and spicy broth is the star of the dish, bringing all the elements together for a hearty and comforting enjoyment. 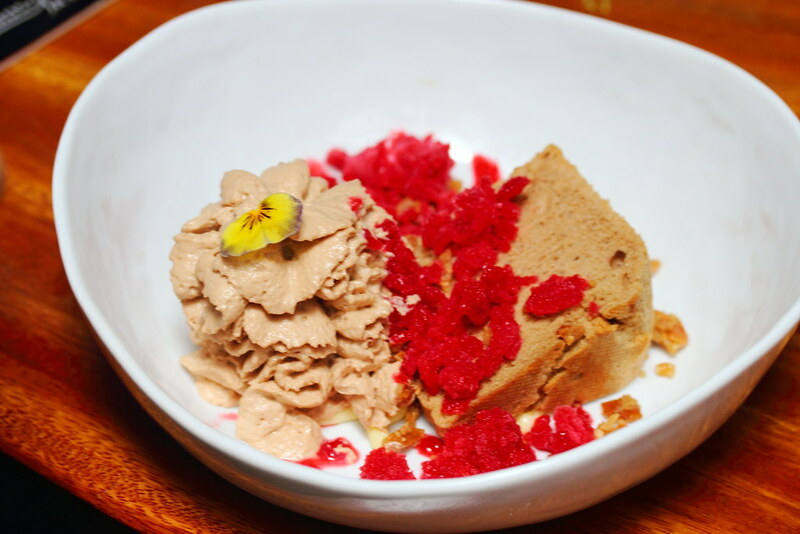 Moving on to the dessert, the Raspberry Granite ($16) caught my attention for the moist and fluffy earl grey chiffon. The dessert is further accompanied with milk chocolate foam, yuzu curd and almond nougatine for a contrasting finishing in taste and texture. 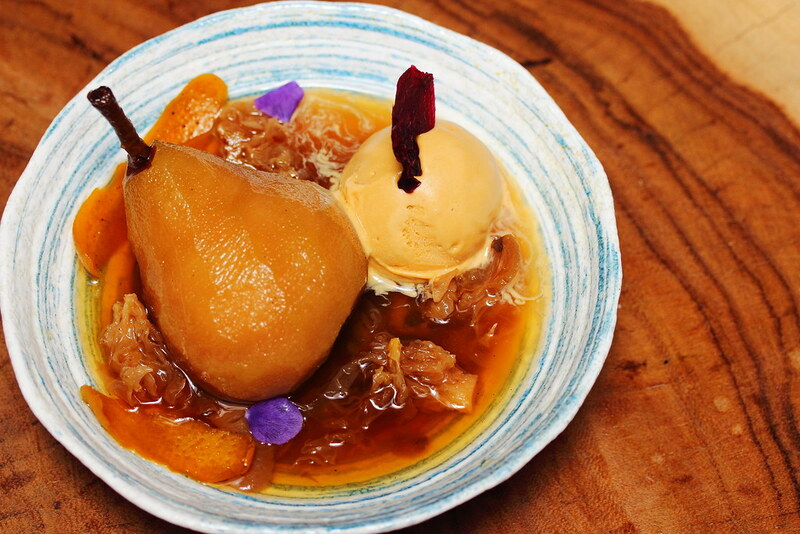 A traditional hot Chinese dessert, the Poached Pear ($12) is given a cold treatment with a scoop of orange caramel ice cream. The softness of the poached pear with citrus, ginger, longan and snow fungus worked harmoniously for a refreshing and cooling enjoyment. You probably can't find the Glutinous Rice Cake ($12) elsewhere in Singapore. 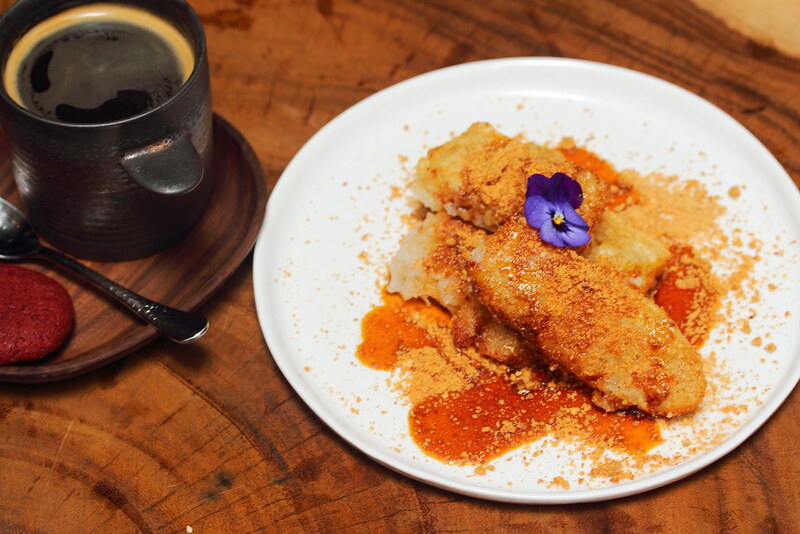 The deep fried glutinous rice cake is drizzled with Okinawan black sugar syrup and topped with peanut. in my own layman term, it felt like eating peanut candy. For cafe hoppers, this is definitely a beautiful place with natural lighting to take great photos. 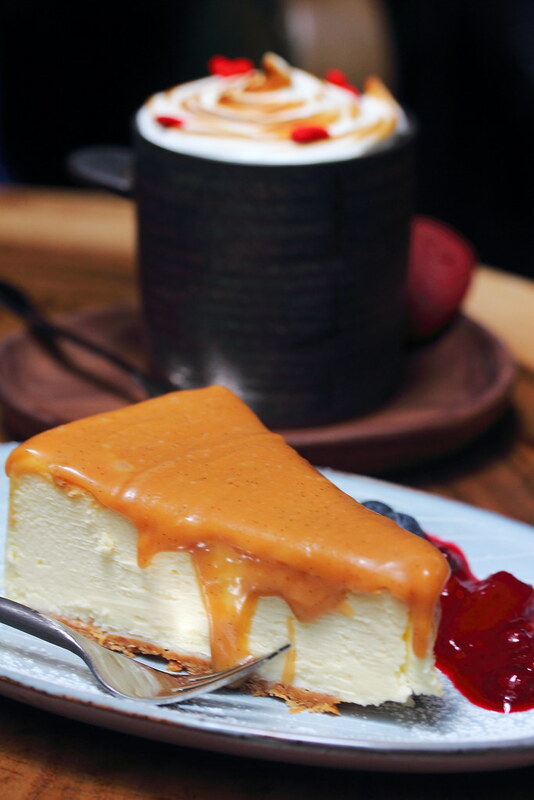 For the not so hungry stomach, there are pastries, cakes and coffee. Immersed in the lush, relaxing and feel good atmosphere while sipping your cup of aromatic coffee, lazing the day away. Stepping into Birds Of A Feather, my first impression was wow. 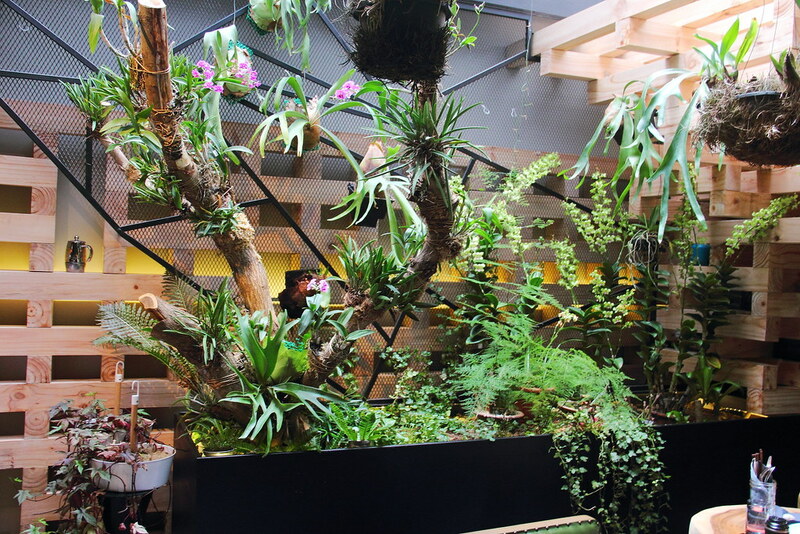 The beautiful decor of the restaurant has set a new benchmark for the local scene. Initially, I was sceptical about the concept but after experiencing it myself, I think it will be a hit.